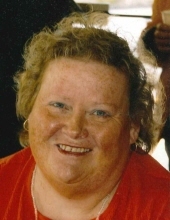 Maureen “Preena” Laughlin, 69, De Pere, passed away peacefully Thursday evening, April 4, 2019. She was born January 28, 1950 to Ruby Kolb and the late Robert “Bob” Ahasay. Preena graduated from West De Pere High School in 1968. She married David Laughlin on September 6, 1991, and he preceded her in death. Preena adored her family, especially her nieces and nephews, great nieces and nephews and loved to spoil them all. She enjoyed singing, loved a good story, and always had a smile on her face, especially when doing things she enjoyed, like shopping or holding a can of Dt. Mountain Dew. She is survived by her mom, Ruby, sisters; Mary Ahasay, Sarah Lynn (friend: Frank) Amundson, Kelly (Bob) Hart, Colleen (Tom) Gatske, and Melinda Ahasay. Preena is further survived by her nieces and nephews; Tricia, Eric (April), Tara (Travis), Molly, Mandy (Patrick), Kayla (Ben), Daniel (Katie), great nieces and nephews; Logan, Ella, Ruby, Wade, Emmet, Rowan, Owen, as well as many cousins and friends. She was preceded in death by her husband David, her dad Robert “Bob”, and an infant sister. Friends may call after 11:00AM Monday April 8, 2019 at Ryan Funeral Home 305 N. Tenth Street, De Pere until time of service at 2:00PM with Deacon Mike Vander Bloomem officiating. Burial will take place in Mt. Calvary Cemetery at a later date. Please go to www.ryanfh.cpm to send online condolences to the family. Bob you called one of your “cackling hens” home, take good care of her until we all see each other again. To send flowers or a remembrance gift to the family of Maureen "Preena" Laughlin, please visit our Tribute Store. "Email Address" would like to share the life celebration of Maureen "Preena" Laughlin. Click on the "link" to go to share a favorite memory or leave a condolence message for the family.